Wireless Terminal Solutions Wi-Fi credit card machines that are enabled for Apple Pay and contactless payment facilities have tranformed ways of accepting Chip and Pin payments. At Wireless Terminal Solutions we are always looking at ways of helping customers to process card payments more efficiently and the Ingenico IWL 258 Wi-Fi card terminal which allows contactless card payments does just that. The Wi-Fi card machine offers a real alternative to the traditional mobile credit card machines that have been widely available for a number of years. Wi-Fi nowadays is plentiful , cheap, fast and most importantly using 3DES encryption, ensures the transactions are processed safely and securely. Wi-Fi Credit Card machines are ideal for retail units, shops and restaurants where payment needs to be taken at a table. It can offer an extremely personal service and is perfect for businesses where a telephone line or router is unavailable. In the past 12 months Wi-Fi credit card machines have become extremely popular for short term payment card terminals hire and Pop Up shops where the terminals connectivity is immediate. The Wi-Fi PDQ machine works perfectly for outdoor events, and not only are WTS a market leader in supplying Wi-Fi credit card machines, but we are also specialists in providing a complete Wi-Fi service for events, without the worry of the Wi-Fi network being overloaded. Wireless Terminal Solutions can provide a bespoke secure Wireless Network with multiple layers of security allowing us to control the users on the network, thus the terminals not being interfered with, and allowing a seamless fast transaction. For a list of all credit card machines services we offer please head over to the card machines page. Why Choose a Wifi Card Terminal? With a super quick installation process into your Wi-Fi password, all chip terminals are fully configured before they are deployed from our Surrey offices. All major credit and debit cards are accepted with our Wi-Fi Credit Card machines. 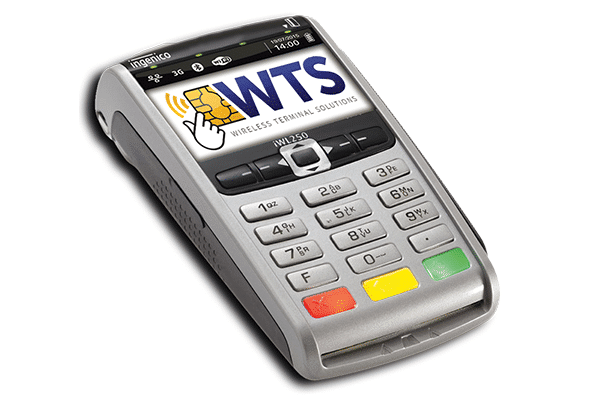 Wi-Fi card machines allow credit and debit card payments to be made to your business anywhere with a wireless connection, eliminating the need for Phone Line or Ethernet cables. Simply input the Wi-fi code into the credit card terminal and it will be fully operational for you. Once you’ve installed your card processing terminal, you can start taking fast, secure credit and debit card payments. The Ingenico IWL 258 Wi-Fi credit card machine is ideal for events and exhibitions. Outdoor events with designated wireless connections for card terminals, will also ensure the card machines work at their optimum where GPRS coverage can be minimal. Our Wi-Fi credit card machines are contactless enabled, allowing transactions up to the value of £30 to be made with the contactless credit card process. Simply present the payment card to the machine and the transaction will be complete. What are the benefits of a Wi-Fi card machine? Are Wi-Fi card machines more expensive than other card machines? How does a Wi-Fi card machine work? How quickly does it take to connect to a secure network on the card machine? Will my contactless card machine accept contactless payments? Does a Wi-Fi card machine need a secure network? In what scenario would my Wi-Fi card machine encounter an issue connecting? Will a Wi-Fi card machine work at an exhibition or trade show? Will my Wi-Fi card machine work abroad? What do I receive with my Wi-Fi card machine? There are many benefits to using a Wi-Fi card machine, but probably the two that stand out are: the card machine will work anywhere with a Wi-Fi connection, and will allow your business to trade both indoors and outdoors wherever the Wi-Fi connection is. It depends which company you are using, but in general they shouldn’t cost anymore than the traditional countertop, portable or GPRS terminals. The Wi-Fi card machine can be used anywhere with Wi-Fi connection (you will need the SSID). Once you have established the connection with the preferred Wi-Fi connection, the machine can then be removed from the base unit charger and used anywhere in reach of your Wi-Fi signal. With the right guidance you should have your Wi-Fi card machine connected in under 2 minutes. In a word yes! The Wi-Fi technology is advanced and allows customers to pay using contactless cards. A secure network is strongly recommended. The card terminals can connect to open networks, but if this becomes congested this may result in the terminal being slow in processing payments. If you are on an open network or the Wi-Fi connection you are using is intermittent this may result in the card machine not performing to its full capacity. You will need to check the specific venue or event you are attending has the infrastructure to support your Wi-Fi card machine but the vast majority of UK event locations now support this and the Wi-Fi card machine’s popularity has grown significantly grown to reflect this. Yes, but please note you will need to set up a EURO merchant account if you are looking to process card payments in EURO’s otherwise any transactions will go through as pound sterling and it will be up to the customer to work out the difference. You will receive your Wi-Fi card machine which has been tested in-house using our Wi-Fi connectivity. The customer will also receive a base and charger, and most importantly you will receive ongoing UK-based technical support using Wireless Terminal Solutions. To learn more about Wi-Fi credit card machines and how they can benefit your business, please call our customer services team on 0845 459 9984 for a free no obligation quote, or email sales@wirelessterminalsolutions.co.uk.